A few years ago I joined the Pins & Pine Needles quilt guild. Each year they would give us a challenge to help us develop our skills and imagination. So far I have done 3 years of challenges. October we were given our first challenge it was to aplique . That’s all we were told…ok imagination here I come. so I found a pattern om a Magazine of some roses and proceeded to applique them onto a square background. November’s Challenge. Add Circle. This one was easy I added a pocka dot border onto the quilt. but after looking at it there was something missing so I did some reverse applique and added cut out circles around the roses. December Challenge. Curved piecing. This was fun I chose the drunkards path block and surrounded the existing block. This was the 1st time that I Ever did any curved anything. I found them pretty simple as long as I pinned them. January Challenge. Add decorative stitching. Having a Pfaff Expresion sewing machine I had lots of stitches to choose from 100 that is. so I thought id just echo some of the curves in the drunkards path border. This taught me a lesson that I have to make sure that the machine feeds itself evenly or the stitches will not be constant and even. This is definitely a technique I will not do again I really don’t like the results. February Challenge. Wonky border. up till now my center only had 2 colors pink and green. This was going to be a bit more difficult. To my scrap green and pink scrap bins. I pulled our a bunch of scraps that I sewed onto an old piece of fabric to do a Crazy quilt border piece. March Challenge. Repeat an element. for this I chose to repeat the drunkards path border as I just loved the look it gave the middle beginning block almost like a medallion. In 2014 the challenge given to us was to interpret and create. Many names of Television shows were put in a draw bucket. Each member got to draw 2 slips from that bucket. The 2 slips that I ended up with where “Say Yes to the Dress” and “Psycho Kitty”. I’m so glad I have an imagination right away I had a pretty good idea what I was going to do. It required me to make a trip to the nearest Salvation Army to find a cute baptismal dress that would represent my wedding dress. I had found some cat border at my Local Quilt Shop. I had the dress I had the border. I figured that brides maid dresses are many different colors so wanting to add this into the challenge I sewed a bunch of stript together and sub cut them and re sewed them to for an X. I sewed the dress onto the block and added the border. Something was missing I had wedding and cat but no Psycho. Thinking about how my kittens play and climb my shower curtain why not have the cat climb the dress. Voila my concept. 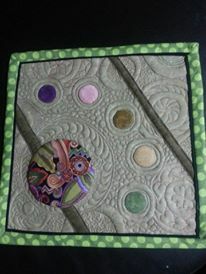 The back to show off the Quilting. In 2015 our challenge was to expand our quilting skills. We were given a 14×14 block that had a two sewn strips and some circles to applique in a certain order. Each member was given the exact same materials. All we had to do was sandwich quilt and bind the block. Heres mine…. These are some form the rest of the girls in the guild. Previous Paper piecing….It all started with a clock.